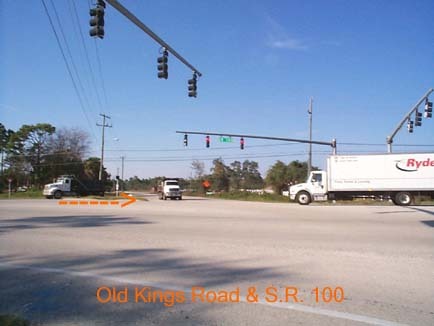 Most began at State Road 100 and Old Kings' Road Intersection. These are our opinions and experiences. This was the location of the start of this part of the Tour. The recorded 'Florida Land Use' Plan states the 'Entrance' is from State Road 100. Atypically most of the potential Buyers and Retirees would arrive via the Interstate 95 system or U.S. 1 . + At the small Wooden Gatehouse the weary traveller would receive complimentary Beverages and a Handout prepared by ITT Levitt from the Attendants there. The travellers also received a Map of Proposed Palm Coast so they could get their bearings of the true Massive size and full scope of Palm Coast. ( See MAP in the Welcome Center Tour and MODELS Brochure in the Models Tour). Little did we realize that where we were going was the Bedrock Foundation Palm Coast - a Planned Community/ New Town of about 100,000 Acres - which, at that time, was advertised as the Largest Planned Community in the Nation...' and '...the Largest - New Town - in the World...'. It is now the 'City of Palm Coast'. and only 68,000 Acres or so they say. All kinds of sizes floating around out there. ( See the page RE: Dr. J. Norman Young and see for yourself the true initial gargantuan size quoted in the early years advertising. Later , the Federal Trade Commission had an Agreement in around 1975 with the Developer and thereing the Federal Trade Commission states '...93,000 acres...'. Lately it appears that it is *re-constituting* itself, ever so slowly, ever so surely, annexing what was once the Biggest Palm Coast. We do not know the present size or what the present density is because of all the annexations of the acreage that once was offered as 'Palm Coast'. We know it was initially offered at '....2.7 per acre density, less than that of Beverly Hills...' according the the ITT Levitts' Advertising promos'...'...An Approach to a New City: Palm Coast..' but we don't know the present *density*. The road went on for Miles and Miles and Miles.... Through dense Palmettos and Slash Pines and Palm Trees. The Prospective Buyer or Retiree quickly realized the Massive size of this Planned Community - the largest planned community, new town, in the Nation. In the Picture above please note the orange arrow. That was the site of the State Road 100 Entrance Gatehouse. Here, complimentary Beverages and Softdrinks, brochures, and a map were atypically give the potential Buyer. Great Business Acumen for those just starting the Tour. The drive was approximately 7.5 or so miles in total length. It was a good opportunity for the potential Buyers to peruse the Brochures and Handouts. The potential Buyers passed miles and miles and mines of only Palmettos, Slash Pines, and Palm Trees. 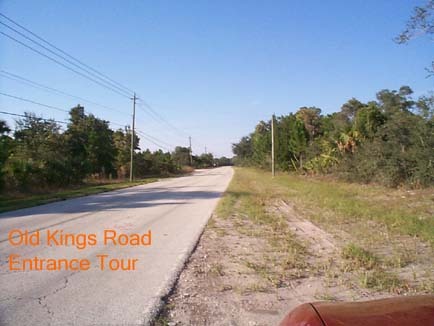 The Potential Buyer or Retiree would travel Noth on Old Kings Road. Surrounded by miles and miles of Pines and Palmettos while reviewing the Handouts received at the Entrance Gatehouse. ...and they would just keep driving and driving. ..and the Potential Buyer or Retiree would just keep driving; reviewing the Brochures and Map; realizing that this was a Big Planned Community. As an aside, on the right , early on, the first small Nursery arrived. It was called Village Greens or Village Nursery or some such selling flowers, plants, and trees. 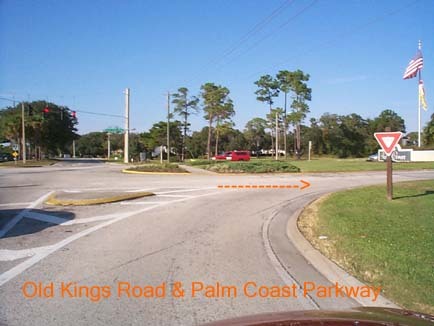 ...After travelling for miles and miles the Prospective Buyer would come to what is now the intersection of Old Kings Road and Palm Coast Parkway East. 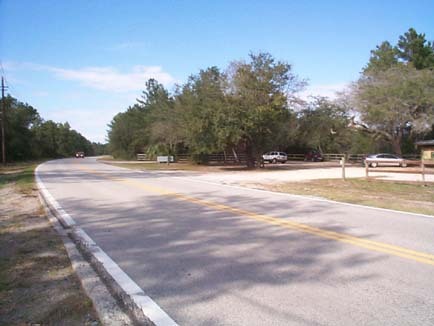 Palm Coast Parkway at that time was an undivided two lane road; presently it is a two lane with median divided Road expanded because of the tremendous growth here. 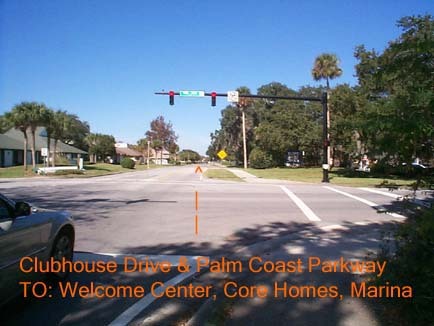 While travelling north on Club House Drive the Prospective Buyer or Retiree would pass the Palm Harbor East Entrance Sign still following Club House Drive. As an aside, most all of the Stop Signs, Information Sings, etc., were made with Gorgeous Cedar wood and Posts. It gave a very earthy personal touch to Palm Coast. We were informed that this practice had to stop because during the Fire Storms the Fireman had difficulty locating places because the Cedar Burned. 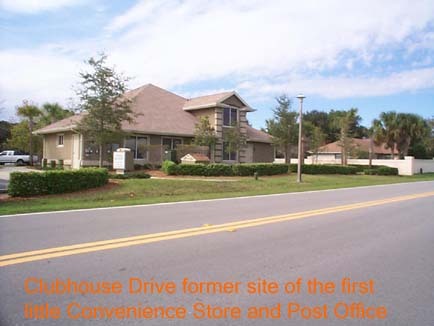 Still travelling East on Club House Drive on the left side of Club House Drive was the site of the first little convenience store and combo Post Office. This was very handy for the first pioneers because there were no Grocery Stores locally. It was a small milk, eggs, butter, bread type convenience store and served to be very handy between the weekly trip to Ormond Beach, Daytona Beach or St. Augustine. There is presently a new Medical Office Building at this location. On the right hand side of Club House Drive is the Golf Course. 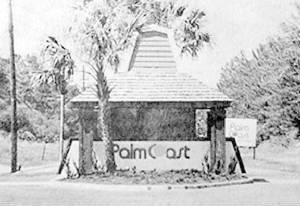 To our knowledge, it was first Golf Course in Palm Coasat, Flagler County and was called the Palm Coast Golf Course. It then became the Palm Harbor Golf Course. The Golf Course is circular in design and almost completely surrounds and envelops the first Neighborhood or Original Core Homes. Club House Drive borders the Golf Course so the Traveller could pass by and see the Golf Course Greens. This would be of great importance obviously for the Traveller especially if they Golfers! Again, a great promotional and good Business Acumen. The Travellers still following Club House Drive West would see the Golf Course and directly behind it the rear of the Original Core Homes. The Original Core Homes were available in 'Golf Course Area' ( Premium Lots. Within the Golf Course were 'Premium Lots'; directly facing the Golf Course was Premium and priced still higher. 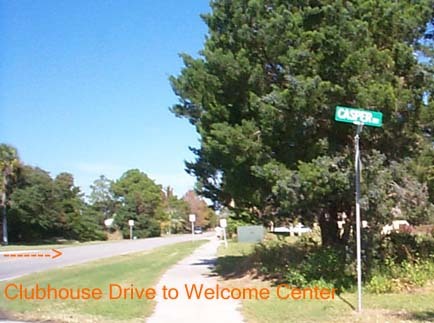 ...At this juncture of Club House Drive and Casper Drive the Prospective Buyer or Retiree could either go North to the Official Welcome Center and Tower or circle around the Original Core Homes. 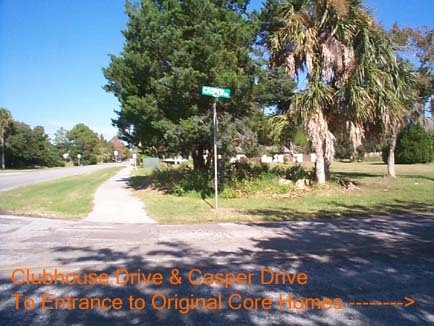 Many of the Earliest visitors obviously would only see the Construction Phase of the Original Core Homes; once completed the White, later Blue, 9 Passenger Vans , emanating from the Welcome Center would tour this first completed Neighborhood to give the Prospective Buyer a concrete example of a Neighborhood in Palm Coast. This Application would enable them to clearly 'envision' what their neighborhood would be like if they purchased in Palm Coast. There were many many components of the "GUIDED TOUR" offered initially by ITT Levitt, later ITT ICDC, - after all, this "GUIDED TOUR" components were good business acumen! IT all SOLD Land ! Prospective Buyers or Retirees would see a peaceful and tranquil Neighborhood, with a Child Neighborhood Park, the residents , some on their own Golf Carts , travelling back and forth to the 19th Hole. 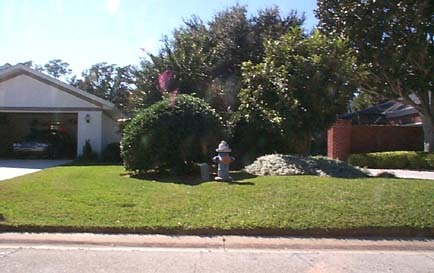 There was a large Sign, first labelled Palm Coast Golf Course at this intersection. It was renamed Palm Harbor Golf Course. 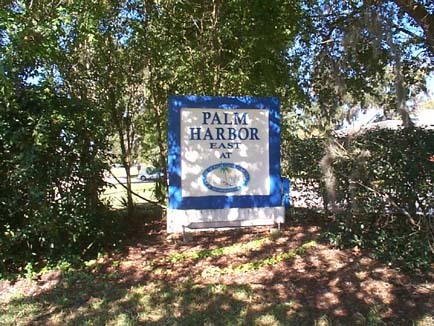 The Sign Marker was similar to the Palm Harbor East Signage in the picture below. It was much larger, emplasizing the Palm Coast Golf Course. It was located directly behind the Casper Drive Street address sign where the palm fronds and vegatation only exist now. We do not know why the entire Sign was completely removed. To many it seemed more cost effective to just re position the lettering to read 'Palm Harbor East' and repaint the entire Large Sign. This is an example of a Landmark Sign that the Traveller and Prospective Buyer would see. 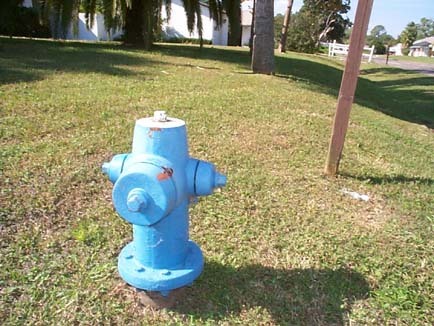 It was located at the intersection of Clubhouse Drive and Casper Drive. 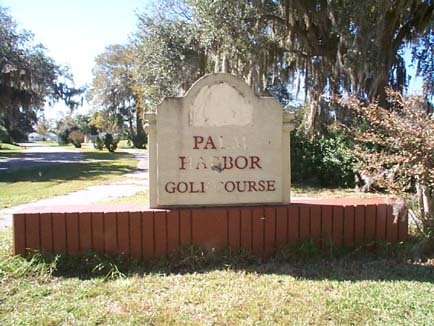 This Landmark Sign would have been labelled Palm Coast Golf Course instead of Palm Harbor Golf Course. This was the Entrance for Parking to the Welcome Center and Model Homes. This is all that remains of the Welcome Center, Parking lot, and Model Homes , called the 'Exhibit Area' site. 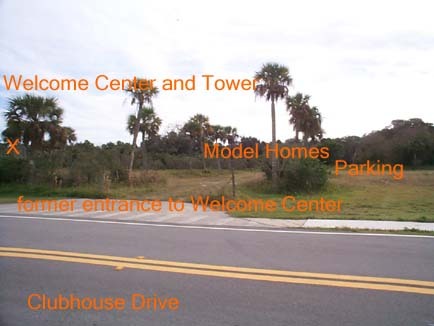 Once the Prospective Buyer or Retiree Parked in the parking lot in front of the Welcome Center it was a short walk over a planked wooded bridge to the Entrance of the Welcome Center and sample Model Homes site. Once inside, they sat in the large Room and saw the A/V presentation of what Palm Coast was all about. On one of the inside walls there was an extremely large Map. It indicated the full size and scope of Planned Community of Palm Coast. Handouts were given and atyplically the prospective buyers or retirees would travel UP the elevator of the Tower. 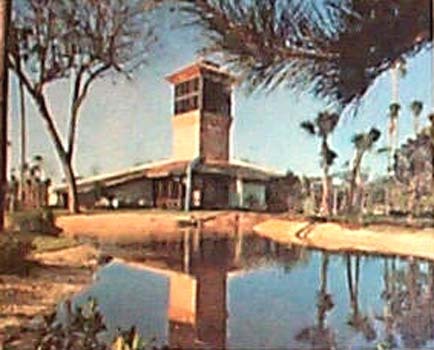 This was a four sided windowed Tower Room from which a lot of the Topography of Palm Coast could be viewed from this high vantage point. 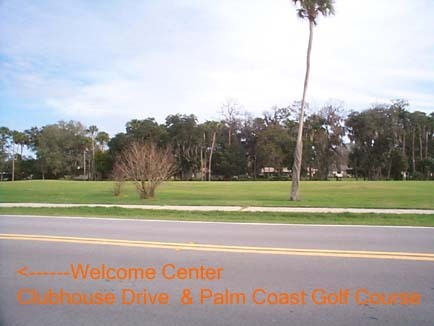 From this Welcome Center area the Prospective Buyer or Retiree could take the Walk around the sidewalks of the ITT Model Homes, take the White 9 passenger Van ride to tour the 1st Neighborhood of Original Core Homes surrounded by the Palm Coast Golf Club (later renamed the Palm Harbor Golf Course), or take a Boat Ride Tour leading to the Palm Coast Golf Course 'Boat to Golf' Dock at the Palm Coast Golf Course, later known as the Palm harbor Golf Course or also to the Sheraton on the Beach; or later take the then expanded Van Tour of what was the Palm Coast Swim Club and Tennis Courts. The Model Homes area was adjacent to the Welcome Center. Here, prospective Buyers or Retirees could walk around the Model Homes sidewalk and tour inside the Models. It was a large Circular cement sidewalk with each Model connected to it by a entrance walkway. 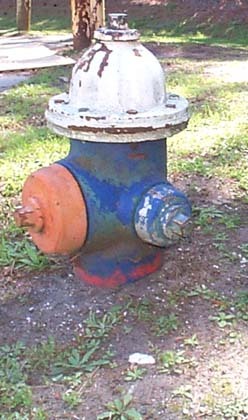 The first Models included The San Remo , The Santa Roas, The Boca Rio, The Del mar, The Andalusia, The San Marcos, The Ponce De Leon, The Desoto, and The De Bary. 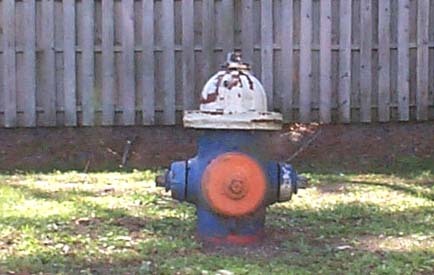 The Model in the above picture was the Ponce De Leon Model. 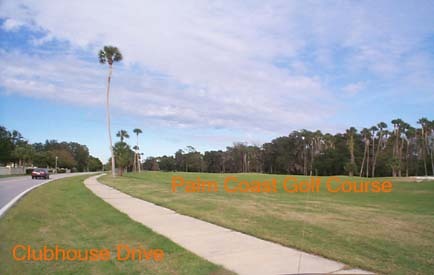 The Prospective Buyer or Retiree could then choose to take the white then later the Blue 9 passenger Vans to tour and view the Original Core Neighborhood which was surrounded by the then known Palm Coast Golf Club. Or they may choose to take the Boat Tour to the Sheraton on the Beach. Or they may choose to take the Van ride to the Palm Coast Swim Club and the Palm Coast Tennis Courts. (On the extreme east side of Club House Drive was: The Yacht & Swim Club was later or also known as the Yacht Club and/or Marina or The Sheraton - The Harborside ) which came later ( Many name changes and references). ACCESS: Access to the property is from Interstate Highway 95 to State Route 100 and then Old Kings Road to Palm Coast Parkway, Access to homesites will be over hard-surfaced streets. ( Full Documents available ). + We never met any but most probably there may have been a few Prospective Buyers entering via Sales offices of the Welcome Center in Flagler Beach, on the less travelled A1A . ++Additionally, Old Kings Road may have been dirt and/or coquina crushed shell or whatever, at first; we don't recall that - The Goal was to 'Get There'. ! We will continue to remain Stewards of this information; hoping for a Museum like Flagler Beach already has.